Feel at home as soon as you step aboard the small 319.5-ton Celebrity Xploration that accommodates just 16 guests, making her ideal for a multi-generational cruise or get together cruise with friends. 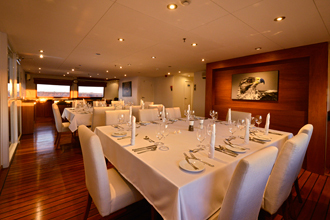 The high-end catamaran which was refurbished in 2016 and made her debut in March 2017 was designed to offer the ultimate travel experience for nature-lovers. Celebrity Xploration offers eight cabins, both indoor and outdoor dining areas, two bars, a lounge and a Jacuzzi. Complimentary offerings include meals, bottled water, wine, beer, coffee, WiFi, plus use of snorkeling equipment and wet suits. Enjoy a delightful sense of camaraderie with fellow explorers as you are pampered every step of your journey by an attentive yet unobtrusive staff. Celebrity Xploration provides the perfect way to explore the Galapagos — one of the world's most fascinating destinations and pristine environments. Your adventure will be even more special with the shared expertise of Galapagos National Park certified onboard naturalists and other experts who will guide award-winning shore excursions, briefings and more. 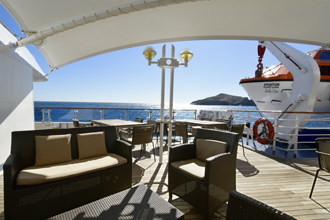 Head to the Sun Deck where you can enjoy the views, relax in the hot tub or watch the stars at night. The Lounge is a comfortable and popular venue for a cocktail, to listen to a fascinating lecture, watch a documentary and meet new-found friends. Delicious culinary delights will be prepared for you, including specialty meals and regional dishes designed by Celebrity's Michelin-starred chef. They are sourced from the freshest local ingredients and use the highest-quality sustainable seafood available that will please your palate. Local coffee, chocolate, premium spirits and an extensive wine list are also featured. Dine at the main outdoor restaurant where you can savor mouthwatering cuisine as you share the day's exciting events and plan for the next. An Early Riser continental breakfast and a daily lunch in the lovely open air shaded by a canopy may be enjoyed here. Stay in cozy deluxe accommodations on the intimate Celebrity Xploration, boasting just eight staterooms, all with ocean views from a large window or veranda. They include the 180-square-foot Junior Suite with a 48-square-foot balcony and the 190-square-foot Elite Oceanview Stateroom. Each room has LCD TVs and WiFi. Experience a unique adventure in delightful comfort on the intimate Celebrity Xploration for an unforgettable luxury expedition cruise. 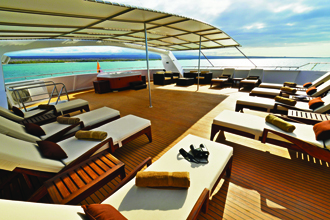 Cruise on the Celebrity Xploration to the Galapagos. 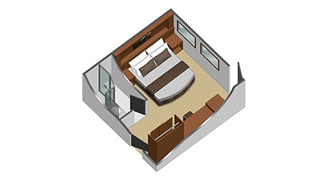 Features: [190 sq ft] An ocean view with large picture window, two lower beds, convertible to king, dual voltage 110/220 AC, plentiful storage space in your bathroom and wardrobe. Flat screen TV, Direct-dial telephone, individual safe, Desk, thermostat-controlled air conditioning, private refrigerator stock with choice beverages and Wi Fi. Amenities: Choice of soft or firm mattress, Duvet cover, Pillow menu, 300 thread count, 100% Egyptian cotton linens, Hair dryer and Complimentary use of premium bathrobes. Services: Room service (breakfast, lunch, and dinner available upon request), Luggage delivery at boarding and Laundry service (additional charges apply). 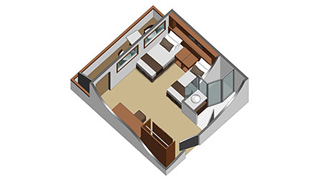 Features: [180 sq ft and veranda 45 sq ft] Large picture window and door, two lower beds, convertible to king, dual voltage 110/220 AC, plentiful storage space in your bathroom and wardrobe. Flat screen TV, direct-dial telephone, individual safe, desk, thermostat-controlled air conditioning, private refrigerator stocked with choice of beverages and WiFi. Amenities: Choice of soft or firm mattress, duvet cover and pillow menu, 300 thread count and 100% Egyptian cotton linens. Hair dryer, complimentary use of premium bathrobes, complimentary beach towel service, binoculars for use and available for purchase and complimentary use of snorkel equipment and wetsuits. Service: Room service (breakfast, lunch, and dinner available upon request), Luggage delivery at boarding and Laundry service (additional charges apply). Open during the day and night. Great place to recount the day's activities and relax with friends. In addition, lunch, and on special occasions dinner, is served here.